Prezi is a cloud-based presentation application that lets you use motion, zoom, and spatial relationships to bring your ideas to life. Interestingly, it is based on an infinite canvas. This canvas, along with Prezi’s zoom in and zoom out capabilities, is one of the most powerful features that currently sets Prezi apart from its competitors. Prezi is the brainchild of Adam Somlai-Fischer, a Hungarian media artist and architect, who felt that the traditional form of slides limited his creativity. He joined forces with Peter Halacsy, and Peter Arvai to develop the first version of the application, called “ZuiPrezi”. ZUI for the Zooming User Interface and Prezi as the Hungarian diminutive for presentation. However, the name was soon changed to Prezi. Prezi works like a huge mind map where you are free to arrange your images, videos, and text. You can easily make the important aspects big, to get your audience attention easier, and the details smaller. Once you have the components of your presentation on the canvas, you can set the storyline using a path. If these terms are new to you, don’t worry. We’ll explain them later on. If you are relatively new to Prezi, it is essential to understand correctly how to use its most important features, like paths and frame animations. When used incorrectly, transitions could make your audience feel dizzy. Of course, you are keen to avoid that. However, when correctly used, frames and paths are making Prezi superior to any tool you might have used before. Prezi doesn’t force you to use a linear storyline. Instead, you are free to follow any format suits your presentation best. You can easily communicate complex and nonlinear concepts, move seamlessly between frames, and build each idea separately before showing the big picture to your audience. With Prezi, it is also very easy to switch back to any frame when you need to answer questions from your audience. However, Prezi doesn’t force you to use it in this nonlinear way. You can always switch to the traditional manner. Also, it allows you to import PowerPoint slides. Prezi does a very good job when you need to embed multimedia into your presentation. Hence, if you are looking to add images to enhance the overall look and feel of the presentation or just want to emphasize an important aspect, Prezi offers a built-in Google image search that can filter only those images that are licensed for commercial use. Likewise, Prezi is extremely flexible regarding audio and movies, and lets you add YouTube videos by copying and pasting their URL. If you have your own video, you can also upload it directly into your presentation with ease. Another big advantage of Prezi is its ability to facilitate collaborative work by allowing several persons to edit and add content to the same presentations. But there is more to it. Prezi’s user interface shows in real time the activity of other members. Frames are used to group several pieces of content together. 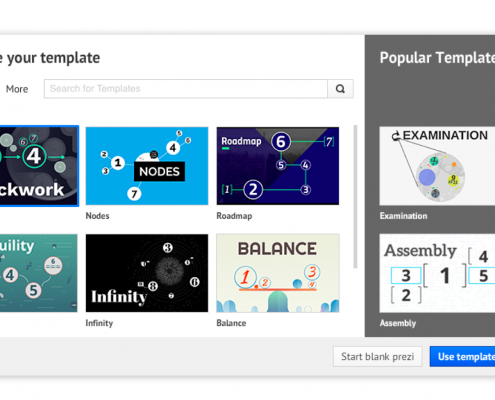 You can think of Prezi frames the same way you think of PowerPoint’s slides. It is the blank space you use to create a presentation. Unlike a physical canvas, you can zoom into any parts and hide the rest. Unlike Powerpoint, Prezi lets you preset transitions between different frames. Even if it’s not mandatory to define the path you wish to take, most people rely on paths to set the speed of transitions and other visual aspects. Now that we have an understanding of Prezi’s key terms, let’s see how to get started with. Even if Prezi allows you to begin working with a blank canvas, this approach can be time consuming, at least for a newcomer. Instead, to give your presentation a slick look in a few minutes, you can start working with one of the many built-in templates. With only a few steps, you will be able to tweak your template and give it your own personal touch.Templates are specially designed to assist you with the transition from traditional presentation tools like PowerPoint or KeyNote to Prezi’s dynamic format. You don’t have to worry that a template will limit your creativity. They are simply designed to save you lots of time and will help you understand the benefits of using a nonlinear style. Prezi sets up templates in a range of styles, and when you choose one, you should consider which one works best for you. So don’t hesitate to take some time and experiment with the different styles and get a feel for how they work. Now that we have our presentation created on a Prezi template, we can start customizing the colors and adding text. To do that, you must click the customize button on the top of the screen and… start working on your presentation. hover the mouse over a piece of content to select it (a blue box will appear). Then you can zoom into it. Another easy way to start working with Prezi is to import existing content from a PowerPoint presentation. With Prezi, each slide is turned to a separate frame. When a slide is imported, Prezi smartly identifies each individual element like title, body, and images. This allows you to edit work on the elements separately. In many classrooms, PowerPoint is the default presentation tool. However, its overuse tends to lead to disengagement. On the other hand, Prezi is a learning tool that resembles in many ways mind maps. Its nonlinear approach, unique zoom-in and zoom-out functions, along with its special approach to navigation make Prezi an incredibly useful tool for education. Prezi presentations are immersive. With pictures, videos, audios, and stunning visuals you will provide an almost cinematic experience to your students. Prezi was designed to be used along with the new touch-based devices like iPads. Hence, it allows students to use it anywhere and anytime and it provides a playful learning experience. Prezi presentations are saved in the cloud and you can easily share them with your students. When at home, they can open the presentations, visualize the main concepts, and understand the connections between different elements. On top of these benefits, Prezi provides great educational subscriptions. PowerPoint allowed anyone in business the chance to express an idea. It added much needed visual effects to business messages, and it was easy to use. As such, has become an almost standard piece of software in many companies. As a result, these days, most of the business presentations show the standard PowerPoint scheme that everyone already knows. Maybe they have some minor tweaks, but they still look outdated. But Prezi brings important advantages. To put it short, it will really help you stand above your competitors. It will allow you to share your ideas online and collaborate with your colleagues. Even more, with Prezi you can import your old PowerPoint slides. To conclude, when you are addressing potential investors or deliver a sales presentation, you have stand out. With its unique style and visually engaging and presentations, Prezi can help a business presentation break the norm and be remembered. PowerPoint is included in Microsoft Office and has been the most widely used presentation software for many years. It benefits from an impressive gallery of themes and it has a large user base that can help if you run into trouble. Apple Keynote is an established product that, for years, has been the standard for many Mac users. Like all Apple products, it is tightly integrated with the MacOS ecosystems and it provides an easy access to multimedia content via iTunes and iPhotos. Furthermore, it provides multiple themes that could boost your creativity. For Mac users, Keynote is included in the price of their computer. Also, its iCloud version is free to use for anyone with an Internet connection. It is part of Google’s productivity office suite and you can access it from any browser. Like Prezi, it is a good option when you need to share your presentation online. Many users appreciate Google Slides collaborative approach that allows different contributors to simultaneously work on the same document. Furthermore, Google offers the Q&A feature that lets attendees to communicate with the presenter through an HTTP link. 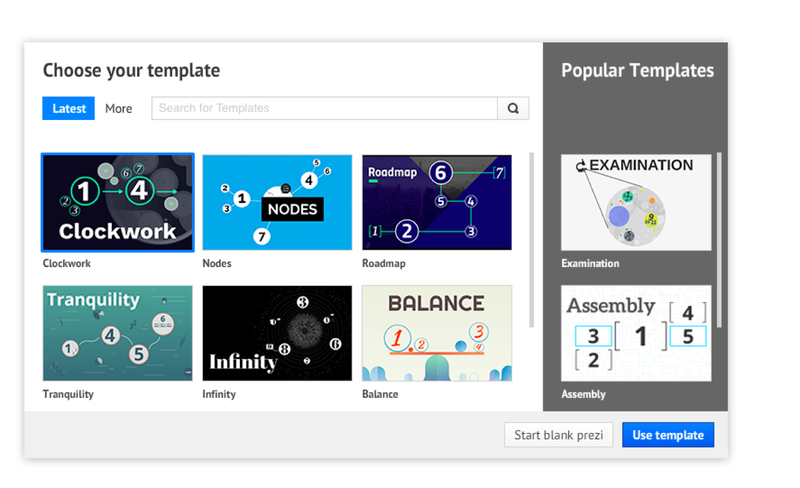 Prezi Next, the latest update from Prezi, uses the best storytelling elements found in Prezi Classic and adds several innovative features such as private presenter notes, intuitive editing, and customizable designer templates. In many aspects, Prezi Next simplifies many aspects of creating a presentation and is welcomed by the users that are still coming from the PowerPoint mindset. Prezi Next is also an important step forward because it relies on HTML5 instead of Flash, witch gives a smoother feeling to your presentations. However, Prezi Classic still has its adepts who love to have control over all customization aspects. The good news for for them is that the old version is still available and the company announced that it has no plans to discontinue it. Premium, for $59/mo you enjoy the full features of Prezi, including analytics and online trainings. Microsoft PowerPoint is bundled together with the other components of the Microsoft’s productivity suite. Prezi Desktop is in many aspects similar to the online version of Prezi, but once you have completed the registration process it does not require an Internet connection. This means that you are the only one responsible for the security of your files. Prezi desktop is useful when you work offline. Just imagine when you have to incorporate some last-minute information on a flight. Need Professional Prezi Presentation For Your Business? Prezi appeals with its innovative features the lets your creative juices flow. These days, audiences are tired of slide-based presentations, so Prezi’s immersive presentations have the WOW factor. In the future, Prezi might become more commonplace or other ingenuous alternatives might appear. But, until this happens, Prezi should be the go-to application for creating an engaging and beautiful presentation. How To Make The Most Powerful Business Presentation Prezi vs PowerPoint: Which One Is Better?